Ca$h in big with Instagram! Want to create a hype around your brand online and be discovered by even more people from all over the world? Want to convert browsers into shoppers and grow sales for your business? If yes, then Instagram is an effective tool for taking your e-commerce business to the next level. More than 500 million people actively use Instagram every month, liking 4.2 billion posts every day. Users have shared more than 40 billion photos to date and share an average of 95 million videos and photos in a single day. 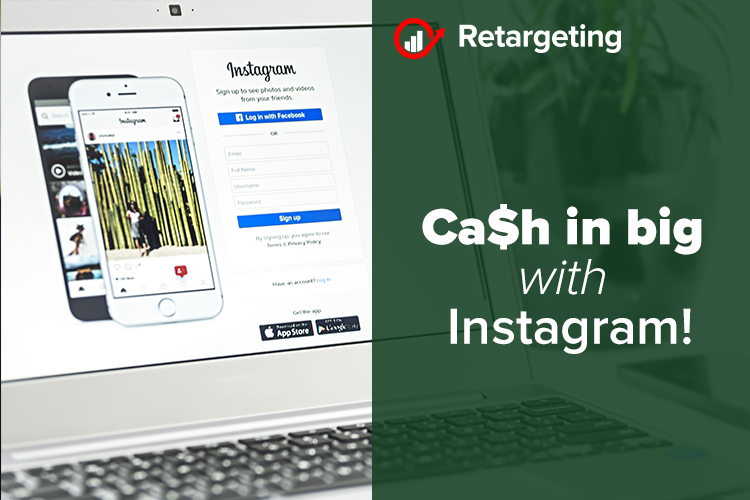 In 2016, the estimated revenue from Instagram accounts was $1.53 billion in total mobile ad revenue. And, in 2017, it is estimated to bring a revenue of $2.81 billion. 48.8 percent of brands use Instagram as a marketing tool. Specialists estimate that the percentage is expected to scale up to 70.7 percent. Whether you are a startup or an established brand looking to penetrate deeper into the market, attract more people to buy your products or services, and build a strong brand value, Instagram is the solution to convert passive shoppers into active customers. Here are a couple of examples of how to take advantage of Instagram and grow your business. Find out how Instagram can drive sales for your business below. An image says more than 1.000 words! Online shopping relies heavily on visual. People want to see the products they are interested in, see what they look like. If they can’t touch them, they want the next best thing: a lot of images. Instagram, a social platform focused on images, is ideal for this. Encourage your users to create content for you. Ask them to share pictures showing off the products they have bought from your store, then reach out for permission to post the pictures on your own account. This way, other users will get inspired to purchase from you. This kind of referral marketing technique can have a positive effect on your sales. Many fashion-based online portals are implementing this in their social media campaigns as a promotional tool for their businesses. Just posting great images is not enough on Instagram, especially when you have a marketing goal in mind. Every image needs to be supported by relevant hashtags. Using hashtags helps Instagram catalog various kinds of images and products. If you are using appropriate hashtags, your products will be seen by a larger group of people, and more specifically, your target audience. Hashtags also make your profile easier to discover across other social platforms. When your Instagram content is shared on Facebook, the hashtags automatically get published there too. Influencer marketing is a popular way to attract sales. It works the same way as word-of-mouth. A great thing about using this technique with Instagram is that you will have access to people from all niches. When a brand collaborates with an influencer or blogger, their image becomes more powerful. Followers take them more seriously and rely on their product reviews, helping brands improve conversions and attract more revenue. To boost your conversions, run contests and giveaways and offer discount coupons to your followers. It will help increase your number of followers and improve engagement on Instagram. Support the contest with visual content and text. You can start with a teaser campaign like, “Coming soon,” “Sale starting in 2 days,” etc. till you launch your offer. Is your online shop client oriented? Interested in the concept of marketing on Instagram.